Be on the look out for predators that seek to take advantage of you when you are trying to avoid foreclosure. This is a very scary and stressful time for most people, which can make people more vulnerable to scam artists. Howard Shmuckler, (whom we will un-affectionately refer to as the Schmuck from here on), told homeowners to stop making their mortgage payments and avoid contact with their lenders while he collected millions in upfront fees under the guise of a guaranteed loan modification under HAMP (Home Affordable Modification Program). Guarantees are not possible in circumstances involving foreclosure or home loan modification. The Schmuck preyed on vulnerable victims who in the end wasted a lot of time and money on a scam – when they could have been working directly with HAMP to save their homes. How to spot a Schmuck? Homeowners should never pay a fee for loan-modification assistance. Government and nonprofit housing counselors provide this service for free. Steer clear of anyone advising you to stop paying your mortgage payments or to stop talking to your lender. Avoid anyone that offers a guarantee to stop foreclosure. Some of the Schmuck’s victims may have been eligible for loan modification if they hadn’t stopped paying their mortgage. Read more about the Schmuck here. Both fake and legitimate law firms send enticing letters to homeowners who are not in financial distress. In these letters, the law firm claims that the homeowners have been wronged by their lenders and may be eligible for restitution. Homeowners are then asked to pay their share of legal fees. This is referred to as a mass-joinder scam in which borrowers are invited to file separate law suits but share legal fees. What you need to know: Never pay a fee to become part of a class-action lawsuit. Read about Kramer & Kaslow – a California law firm accused of deceptively marketing mass joinder lawsuits to consumers. If you receive a phone call in which the salesperson says they are going to audit your mortgage loan documents and use the violations they find to force your lender to approve a loan modification – hang up! These salespeople who seem genuinely concerned for your welfare will eventually ask for a fee to complete the audit – an audit that will never be completed! What you need to know: Consumers can find legitamate, local HUD-approved counselors at the HUD website. Don’t trust anyone that asks for an upfront fee to help you with your loan modification. The Federal Trade Commission has posted a Consumer Alert referring to these fraudulent “rescue” professionals on their website. 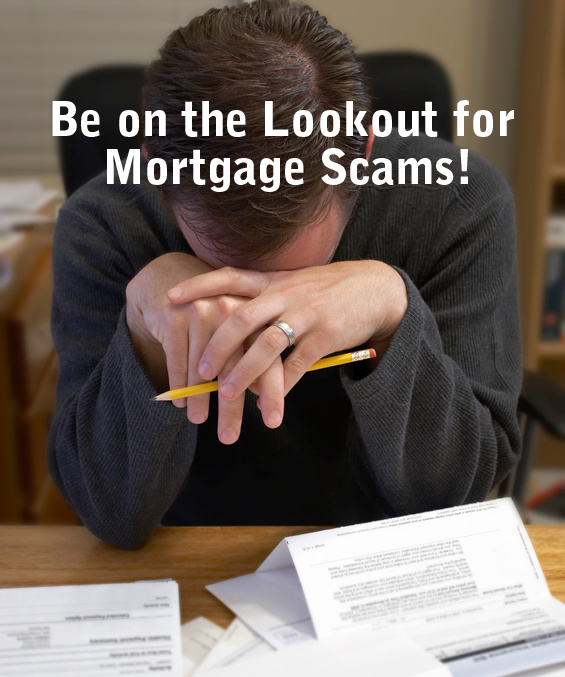 Have you or someone you know been a victim of a mortgage scam? This entry was posted in Lending Lingo, News & Events and tagged BBB, foreclosure, fraud, FTC, guarantee, loan audit, loan modification, mortgage relief, mortgage scams by Inlanta Mortgage. Bookmark the permalink.